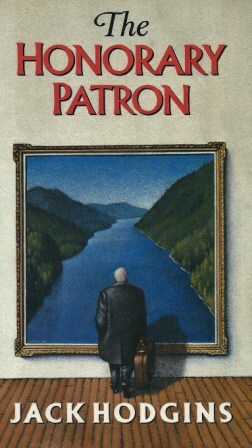 The Honorary Patron by Jack Hodgins ~ 1987. This edition: McClelland and Stewart, 1989. Paperback. ISBN: 0-7710-4190-X. 413 pages. My rating: 6.5/10. You’ve got to be in the mood to fully appreciate Hodgin’s rather cumbersome playfulness in this one. I guess I’m not quite in the right frame of mind. It was pretty good, and I smiled my way through, but I can’t see myself picking this one up again any time soon. Still a keeper, for a few years hence. Bottom or top shelf – not in the premium placings. If you liked Timothy Findley’s Not Wanted on the Voyage, or anything by Robertson Davies, you’ll probably look on The Honorary Patron with interest. I think the genre here might be what is termed “magical realism”. Everything is based firmly on solid ground, but the farcical bits go way over the top, tipping the reader off early on that this is not simply an amusing narrative, but something much more playful and far-flying. I get the feeling that Jack Hodgins had a wonderfully self-indulgent time writing this one, and there are more than few cunning digs at his native Vancouver Island and the residents thereof. (Unloading some old baggage, eh, Jack?) But he keeps just this side of spitefulness, so it’s all good. Not-quite-elderly Professor Jeffrey Crane is settled comfortably into life as a Canadian expatriate in his adopted habitat of Zürich. He has a solid reputation as an accomplished art lecturer, a respectable retirement income from his university teaching days and his still-popular television series, and looks forward to an unbroken future of gentle walks in the park, trips into the countryside to visit his landlady’s family, and long hours spent napping in the sun at his favourite rooftop cafe. All of this is threatened by the sudden tempestuous arrival of a very-much-alive ghost from the past, his Canadian ex-lover Elizabeth Argent, who bursts in on Jeffrey as he sits up in said cafe, searching frantically for his shoes – which he always kicks off, a running gag throughout the book – so he can escape. He is captured, and thoroughly subdued by vibrant Elizabeth, who has sought Jeffrey out to convince him to come back to Vancouver Island and act as the Honorary Patron of the newly minted Pacific Coast Festival of the Arts. A few speeches, a lot of nodding and smiling, a chance to revisit old haunts, what’s to worry about, Jeffrey? As it turns out, there are many surprises waiting for the Professor on his long-abandoned home grounds. The coastal rainforest is crawling with old secrets nurtured and embellished, ready for revelation, and unanticipated new situations which Jeffrey, exceedingly unprepared, steps into with bizarre results. Hodgins paints this picture with a palette brimful of colour and dazzle, using a combination of wildly broad strokes and occasionally the most delicate of detailing where his attention is focussed momentarily. Does it work? Well, sort of. The Honorary Patron is a bit of a forgotten book, though it did win an award or two – Commonwealth Writers’ Prize for Best Book in the Caribbean and Canada, 1988, for starters. Hodgins is a good writer, no quibbles about that, but I wouldn’t recommend this as a place to begin in exploring his body of work. Spit Delaney’s Island would be my personal recommendation, and then see where (and if) you go from there.